Last week I took my AirBook to Café Betty Beer to work on my important avant-garde novel while enjoying an echte Rotterdamse lunch. The day was warm, and I sat on the cafe’s terrace, beside the Schouwburgplein. (…)The Schouwburgplein, the Binnenrotte, the Museumpark, even the comparatively cozy Noorderplein, resemble the beaches of Normandy, mapped and strategized for this or that festival to land, erect its equipment, and do business, before tearing down to depart without leaving a trace. For this function, Rotterdam’s public squares are superbly designed. The slight confusion between a cosy lunch café and the vastness of Schouwburgplein that this anecdote by writer Matthew Stadler evokes, might serve as a contemporary illustration of the conflictive history of this Rotterdam square as a public space. Urban theorist Martijn de Waal takes Schouwburgplein as his central subject in the trade version of his PhD dissertation, The City as Interface: How New Media Are Changing the City. While Stadler chooses not to focus on what the square lacks in terms of function-oriented design by ordering a jenever,2 De Waal’s text argues more intensely that we probably should think about the function of spaces. Especially since these are the places where people from different parts of the city gather, meet and eye each other, discuss football, movies and theatre, or even politics. In short, the question becomes: What is the function of the square as public domain, given it has been pondered and idealised now for centuries? And further, how relevant are the periodic, theoretical romanticisations that De Waal brings up from those born in eighteenth-century London coffeehouses to Walter Benjamin’s flaneur to Hannah Arendt’s and Jürgen Habermas’s ideal of a rational, neutral, public sphere? The examples mentioned above are explicitly spatial accounts of the public domain, where “city dwellers” meet each other as they leave the privacy of their houses and the vicinity of their neighbourhoods. But maybe it’s more accurate to say that they offer a “bricks-and-mortar” perspective, connoting Stadler’s reverie as he sits down on a terrace in Schouwburgplein. So, what happens when new media step into the game? In The City as Interface De Waal discusses the formation of the public domain and how new media can help it advance – or crumble. Mobile technology, especially, allows the user to transcend spatial limitations and to be present in places without physically being there – just as much as he or she at the same time can be mindless with respect to where the body is located. What does that mean for the formation of an urban, public domain? Can urban media lead to the development of new publics? Or are we left only with individuals taking a seat on a terrace in Schouwburgplein, safely ducking away into their parochial domain glowing from the screens of their MacBooks? The square is indeed an excellent space to host new media applications such as urban screens. As the title of the book suggests, the (future) evolution of communication technologies in urban spaces is also at stake if we think of the city as interface. “What are the underlying urban ideals concealed in technologies?” asks De Waal. “And what is the significance of all these new means of communication for urban societies?” His focus is less exclusively on media and technology than this quote and the subtitle might suggest. Rather, it’s about ideology – or, if you prefer, philosophy. 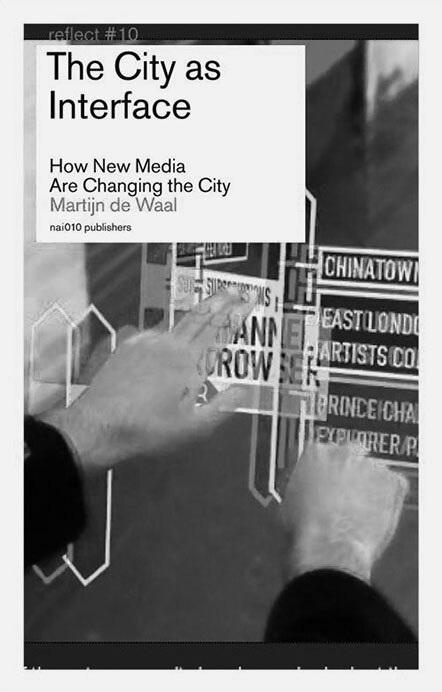 De Waal observes that the way in which media are used in the city, depends on ideology – how we think a city should function. He distinguishes three “ideologies”: libertarian, republican and communitarian; ranging from absolute freedom to keep to yourself, to believing in a set of shared responsibilities towards your community. De Waal takes sides with the republican ideal, which lies somewhere between the libertarian and communitarian positions. Maybe this is also a reason why it seems that De Waal never goes all the way in his analysis of problems and possible solutions: there is always another side to the story. It is a bit a problem of the “radical middle ground”, a discussion that dominated Dutch politics a couple of years ago, when the centrist Christian-democratic party chose this contradictory phrase as their banner. On the one hand, opting consistently for the middle ground might lead to a hesitation to get to the bottom of things. On the other hand, the perspective of the city as interface allows for the development of a theoretical background to this position. The city as interface is precisely relational, in-between, not neutral, catered to our modern state of “networked individualism”. The republican city isn’t bleak, boring and quiet. It instead asks its dwellers to be open, personal and perhaps even emotional. The city of Rotterdam serves as the backdrop for an extensive portion of the book, including chapters on Schouwburgplein and the 1950s suburb Pendrecht. Especially as Rotterdam had to be rebuilt after the bombardment of World War II, this opened up possibilities to experiment and put urban-planning theory into practice. To understand how cities like Rotterdam came to be as they are, De Waal goes back in time to analyse the political, public and theoretical debates around, for example, the redesign of a city square such as Schouwburgplein. Before its official opening in 1997, it was subject to numerous debates with proponents holding opposing ideas about what an ideal square should look like, and, foremost, what it should do. Should it serve traffic circulation, as post-war plans advocated? Or rather, is it better served as a “symbolic living room” with shopping arcades for the flaneur? In finishing the book we are left with a feeling that we’ve learned a lot – especially through the informative and well-written examples De Waal takes from the history of urban design to the myriad art projects that adopt new media in urban spaces to engage the public. But the book also makes us cognizant that the undertaking of truly imagining, let alone realising and also critiquing the city as interface, is yet to begin. 2. To read more see “Echt Rotterdams eten”, De Internet Gids, 20-06-2014. Miriam Rasch has a background in literary studies and philosophy and works at the Institute of Network Cultures in Amsterdam. She writes book reviews and guest posts for various websites and magazines; her personal blog can be found at www.miriamrasch.nl.